Whenever legislation regulating firearms is proposed, no matter how sensible, it never fails to elicit a strong negative reaction from gun rights groups. A couple of weeks ago, the Vermont Senate Judiciary Committee held a hearing on S.31, the bill relating to possession and transfer of firearms. The hearing was packed by both supporters and opponents, each distinguished by the colors they wore: green for supporters and hunter orange for opponents. It was clear that opponents outnumbered supporters by a large margin. Witnesses were called pretty much in alternating order of pro and con, and more than 30 people testified. The objections to the legislation fell into 3 categories: 1) a misunderstanding of what is in the bill, 2) the contention that it violates the 2nd Amendment, and 3) that the background check provision would be unenforceable. So, here is what the bill does and does not do. There are three provisions. The first makes it a crime in Vermont for a person convicted of a violent crime to possess a firearm. This is currently federal law. However, without this provision, the crime would have to be prosecuted in federal court by a federal prosecutor. This provision would allow prosecution by a States Attorney in the Vermont court system. The second provision requires reporting to the National Instant Criminal Background Check System (NICS) persons who are judged in a court of law to be a danger to themselves or others, or who were found not responsible for a crime by reason of insanity or incompetent to stand trial due to a mental illness and are a danger to themselves or others. The third provision requires a background check to be conducted on a buyer of a firearm before it could be sold to that person. There is an exemption if the firearm is transferred or sold to a family member or a law enforcement agency, or to an police officer or a member of the Armed Forces acting within the course of their official duties. It does not prohibit loaning a firearm to a friend for an afternoon of shooting or hunting as some opponents claimed. This is the most controversial provision, although most opponents see every part of the bill as an infringement on their constitutional rights. On the contrary, courts have upheld the constitutionality of background checks passed by 16 other states. Moreover, background checks are required when a gun is purchased through any federally licensed firearms dealer like a sporting goods store or gun shop. This bill merely extends the requirement to online and person-to-person sales and also closes the so-called "gun show loophole", where a private seller would not require a background check while a licensed dealer in the next booth would. We all know of the increased prevalence of heroin trafficking. Studies have shown that guns obtained in Vermont are part of the currency of the drug trade coming from New York, Boston, Albany and other places with strong gun laws. According to the Bureau of Alcohol, Tobacco and Firearms, in 2013 alone 165 guns recovered in crimes in other states were traced back to Vermont. This may not seem like a lot, but it is significant considering the size of our population. I do not object to guns or to the traditions of hunting and sport shooting. However, as a gun owner myself I support this legislation because it is necessary to help prevent firearms from getting into the hands of criminals and dangerously mentally ill persons. I have talked to many other gun owners who support this legislation as well because it makes common sense. As the NRA is fond of saying, "Guns don't kill people; people do." So, we have to take whatever steps we can to keep guns out of the hands of the wrong people. Persons who can pass a background check when purchasing a gun from a dealer have nothing to fear from this legislation. As for enforceability, while there will always be an opportunity for a prohibited person to skirt the law by buying from an unscrupulous individual, responsible, law abiding gun owners will be helping to protect their fellow citizens when selling their unwanted guns with a background check as required by law. I am a cosponsor of H.250, a companion bill to S.31 in the House. I continue to welcome your thoughts and questions and can be reached by phone (802-233-5238) or by email (myantachka.dfa@gmail.com). One of the first jobs a legislature has in January is to make adjustments to the current year's budget to balance any gap between expected revenues and actual revenues. While budgets are normally the focus of partisan disagreements, this year's Budget Adjustment Act, dealing with a $19M revenue shortfall, was a pleasant exception. By the end of January the House realigned spending to end the current fiscal year with a balanced, responsible budget and passed the bill on a 135-5 vote. With that important vote out of the way, I decided to devote this report to two bills I introduced. The first is a bill to allow the establishment of “natural burial grounds”. I introduced H.25, after talking with Lisa Carlson, a Hinesburg resident and the author, along with Joshua Slocum, of "Final Rights: Reclaiming the American Way of Death". I had been aware of only two ways of laying the dead to rest: embalming and cremation. It hadn't occurred to me that embalming is a relatively recent phenomenon that arose in the U.S. funerary industry in the 20th century. Lisa pointed out that the downsides include the use of toxic chemicals as well as expensive caskets and the concrete burial vaults to hold them, and that cremation requires very high temperatures generated by burning fossil fuels. On the other hand, the practice termed "green burial" requires neither and allows us to "return to dust" in the natural way that all other living beings do. This burial method is already allowed by state law, but must take place in specially reserved areas of existing cemeteries. Orthodox Jews as well as Muslims practice this type of burial as a religious practice. H.25 will expand the allowable use of the green burial method in an even more natural way. It establishes the right of a landowner to set aside a section of land where such burials can be performed with the additional characteristic that would not require a grave marker, but would allow the land, a field or forest, to return to its natural state. It would require the land to be registered as a natural burial ground and the grave site(s) to be “platted” or mapped for future reference. While most people may still prefer to be buried or to bury their relatives in the usual manner in a traditional cemetery, H.25 will provide an alternative for those who wish their bodies to simply "return to nature". The second bill, H.104, will reclaim the deposits on unredeemed beverage containers for the state. Under current law, the sale of a soft drink or other deposit beverage includes passing the deposit from the final customer to the distributor. If the beverage container is never redeemed for the deposit, but instead is diverted into regular recycling or the trash, the beverage distributor keeps the deposit. It is estimated that between one and two million dollars in Vermonters' deposits are abandoned every year. Since we have paid these deposits for the purpose of maintaining a clean environment, my bill will reclaim 80% of them to help pay for Vermont's recycling efforts. The beverage industry will keep the remaining 20% for handling costs. Three states – VT, IA and OR – currently allow the distributors to keep all of the unclaimed deposits, while five – CT, NY, MA, ME and MI – reclaim some or all of them. In these tight budget times, finding an extra million or two without raising taxes makes sense to me. Now that we are a few weeks into the session, the 14 committees of the House of Representatives have settled into their main work: taking testimony on bills and on the Administration's initiatives. A bill's main sponsor as well as interested parties, administration staff, lobbying organizations and interested private citizens are invited to give their insight and analysis of the subject. Committee Chairs take very seriously the responsibility to make sure every side of an issue is heard. It is detrimental to the success of a bill if key testimony has not been heard when the bill comes to the floor for a vote of the full chamber. On the other hand, convincing testimony against a bill might kill it in committee so that it never reaches the floor for a vote. Since there are more bills introduced in a session than can ever be adequately considered, most bills stay “on the wall”; that is, they are posted on the committee's bulletin board where they remain for the duration of the 16 week session. In spite of these constraints, some bills are so obviously beneficial that they just sail through committee, are read on the floor and pass unanimously. This happened with a water quality bill last week that prohibits the sale of personal care products and over-the-counter drugs containing microbeads. Microbeads are plastic beads less than 5 millimeters in diameter that are suspended in lotions and cleansers as a mild abrasive. The problem is that they are so small that they pass through wastewater filtration systems, are discharged into rivers and streams, and end up suspended in Lake Champlain. They adsorb (attract to their surface) toxic chemicals and are ingested by small fish which confuse them with food. They, in turn, are eaten by larger fish, which are then eaten by humans. In this way the toxins become concentrated up the food chain and pose a hazard to us as well as threaten the sport fishing industry which is an important part of our tourist economy. On a roll call vote H.4 passed unanimously 140 to 0. Many issues require a lot of testimony even before a bill is introduced. Such is the case with education financing. The Education Committee has a new Chair, Representative Dave Sharpe of Bristol. Dave was a member of the Ways and Means Committee for many years and brings valuable experience with taxation to his new role. At the same time the House Rules Committee revised the authority of the Education Committee over education financing. Previously, the Ed Committee made education policy and the Ways and Means Committee addressed the financing. The new arrangement will allow a comprehensive approach to this high priority problem. The committee has already heard from many individuals and organizations and is expected to draft a bill in the next few weeks. Already a change in approach is emerging. Whereas the current method requires setting the statewide property tax rate to be set according to the total amount of school budgets throughout the state, the committee is looking at fixing a statewide property tax rate to raise a given per-pupil amount which would be allocated to school districts regardless of the size of the budgets that they pass. Needless to say, the devil is in the details, and we'll be hearing more about this topic before anything is settled. Mom, Deirdre Holmes, working the projector. 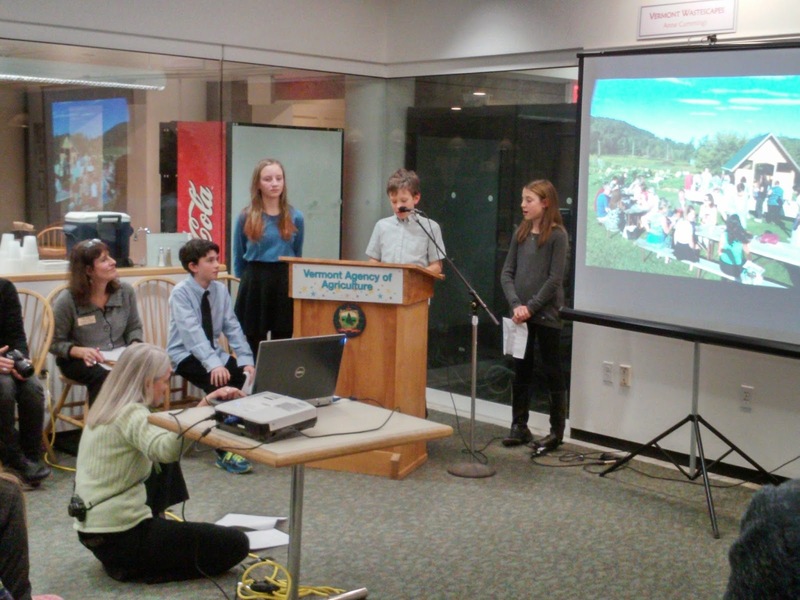 Grade present their report on composting at the Statehouse during the Farm to School awards presentation last week. CCS was awarded a grant last year and the composting project was the result. Kudos to the whole 6th Grade team! A Governor has the primary leadership role for making policy. 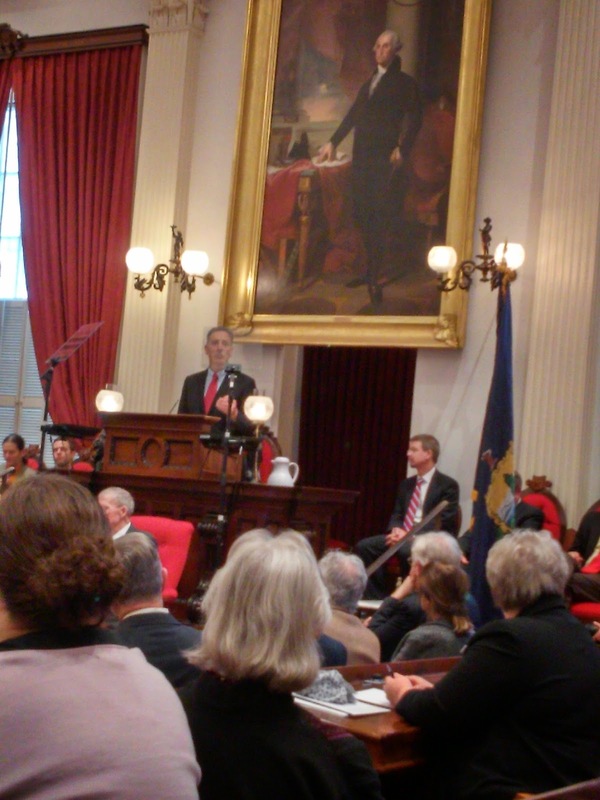 Governor Shumlin laid out his policy agenda in two major speeches, in his inaugural speech and, a week later, in his budget address. In the latter he focused on health care, education, and the economy. Because Vermont's economy has been growing at a roughly 3% rate while expenses have grown by about 5%, the projected gap between revenues and spending for next fiscal year is $94M. Governor Shumlin's first priority was to propose a way to balance the budget. To do this he is looking for a combination of efficiency improvements through restructuring of departments and programs and cuts to some services while simultaneously investing in programs that deliver more economic value than they cost. But efficiency improvements and program cuts won't bridge the gap without additional revenues. So, he is proposing to close an income tax loophole that allows Vermonters to deduct from the current year’s income the state taxes they paid the previous year. Reforming this loophole will cost taxpayers who use it an average of $175 and raise an expected $15.5 million. Since the Governor stepped back from his "single payer" health care initiative, he still recognizes the need to pursue health care reform. Vermont needs to continue to move from the current quantity based, fee for service system to one that pays providers for the quality outcomes they produce. To build on the early success this effort has shown in bending the cost curve while ensuring high quality health care for Vermonters, the Governor’s budget more than doubles payments to Medicaid providers with a new $4.5 million appropriation. Since the Medicaid cost shift drives up private insurance premiums by $150 million every year, the Governor is proposing to invest $25 million beginning in 2016 when new insurance rates begin for increased payments to health care providers. This will mean $50 million in cost shift reduction per year and enable a reduction in insurance premiums by up to 5 percent from what they would have been for all Vermonters. To pay for these health investments, the Governor is proposing a 0.7% payroll tax on Vermont businesses. Every dollar raised will draw down $1.10 in federal funds, more than doubling the money raised through the payroll tax. This tax would amount to 7 cents for every $10 of payroll expense. For a small business that pays employees $10/hour, it would mean an extra $2.80 per 40 hour week per employee, but would reap big benefits for both employers and employees. With student enrollments down 20 percent since 1998, a 10 to 1 average student to staff ratio, and property taxes rising fast, the Governor outlined a number of proposals to help address the education spending problem in Vermont while improving education quality. These include placing a moratorium on any new legislation that adds costs to districts, phasing out expensive incentives including the small schools grant and the phantom student provision, targeting construction aid for districts that are actively trying to right-size through a merger, and prohibiting strikes and board-imposed contracts while requiring arbitration when contract negotiations reach impasse. Some of these ideas are already being discussed in the House Education Committee which has had more than 500 suggestions submitted by legislators, organizations and citizens. Building on expanded dual enrollment and early college programs, the Governor hopes to implement a new program to create a pathway for Vermont Technical College (VTC) students to earn a free Associates Degree in Engineering Technology as a pipeline for Vermont employers looking for skilled employees. Through a partnership of the state, VTC, and private employers, high school seniors who sign up for an Engineering Technology degree at VTC will get their first year of higher education free while finishing high school, then will be guaranteed a summer internship at the partnering employer to gain critical job skills. When they return to VTC for their second year, the employer will pay for their first semester’s tuition (about $5,000). The Vermont Strong Scholars program will then pay back their loans for their final semester if they stay and work in Vermont after graduation. Now it is up the the legislature to take those ideas, meld them with their own, and change Vermont's laws to accomplish the desired results. I continue to welcome your thoughts and questions and can be reached by phone (802-233-5238) or by email (myantachka.dfa@gmail.com).